Three Anchors, located at the picturesque location of Middleton Beach Albany provides our customers with a contemporary food and drink menu that supports fresh, local produce. Enjoy locally roasted, barista made coffees, great southern wines, craft beers, house made cakes and much more while you take in the scenery from our beachfront restaurant. 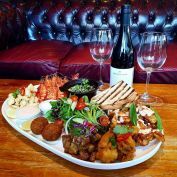 Featuring a wide variety of menu options our ‘Share Plate’ matched with a bottle of Great Southern Harewood Estate Wine is the perfect way to taste your way around the region and enjoy multiple menu options is one sitting. Perfect as a main for two or plenty to share amongst friends. *Please note photo is for marketing purposes and platter options are subject to change with menu availablity.